The 2020 presidential primaries are less than a year from now, and already campaigning is well underway. And while most people see that quadrennial ritual as a way for voters to choose their party’s candidate, a new book argues, that it’s actually the political parties themselves that run the show. Reflecting on 2016, it might seem that the national parties have little control over how the presidential nominations unfold and who becomes their presidential candidate. Yet the parties wield more influence than voters in determining who prevails at the National Conventions. Although the reforms of the late 1960s and 1970s gave rank-and-file party members a clear voice in the selection of presidential candidates, the parties retain influence through their ability to set the electoral rules. Despite this capability, party elites do not always fully understand the consequences of the rules and therefore often promote a system that undermines their goals. The Primary Rules illuminates the balance of power that the parties, states, and voters assert on the process. We think of our political parties as the backbone of American electoral politics, but as Caitlin Jewitt reminds us, “You have to remember, that the constitution doesn’t even mention political parties and it doesn’t mention anything about how we nominate candidates for office . The process has come a long way from smoke filled rooms where the ‘fix was in,’ early, to the endless ballots voted on during long nominating conventions, where the in crowd, that is the politicians themselves and party elites, ran the show. Jewitt says things are different today, well, to an extent. But at the same time Jewitt argues, the rules the parties make –which are totally up to each party- are confusing at best and counterproductive at worst; at least if you still think it’s the voters who do or should select their party’s presidential candidates. She says t each state can change its parties’ rules, with some time restrictions, but also with such frequency, that it’s difficult for the media or anyone else, to explain how things work, to the public. “Voters, citizens are left completely confused for the most part. So, while we would like to think that it is voters, turning out in primaries and caucuses that determine who becomes the nominee, I argue that the parties have much more control than is typically recognized. At present anyway, the Democratic party rules state that only 4 states can vote next February, Iowa, New Hampshire, South Carolina and Nevada. No others can, until Super Tuesday, which is next March 3rd . That’s when Virginia will vote, but while the Republican party normally can’t change rules on the fly, according to its own party rules – the Democrats can. Since all that rulemaking is completely up to the parties, themselves, they too could change. In the Primary Rules, Jewitt says the parties function on one primary premise: electability. Jewitt looks back to the Democratic party’s early anointment of Hilary Clinton as the candidate. Endorsements came early and super delegates were in her corner. By the way, only the Democrats have what are known as super delegates, and while they are not pledged to vote for anyone in particular, and they don’t even get a vote on the first ballot, just their personage holds some sway with their fellow party members. And these nuances just go on and on, creating the folklore that the rest of us call ‘the political process. And for some, once the fever sets in, it’s hard to cure. Jewitt ,herself, caught it as an undergrad, when she spent a term in New Hampshire, during its ‘First in the Nation’ primary election. She was studying the topic and volunteering on a campaign. There was no Republican primary that year, George Bush was running for his second term, but the Democratic party was a contest. That was 2004. These days, more people are paying attention and questioning the electoral process itself. Putting aside for now, the explosive topic of foreign countries possibly meddling with the vote cout – the electoral college has become a sore subject. So while who the candidates are, what the turnout is and which choices voters make, matter a great deal, the primaries rule. This semester, Jewett is teaching a course on electoral politics at Virginia Tech. She says they’ll spend an entire day on voter identification laws and how widely they vary. In some states you a photo I.D., while in her home state of New York, all you need is to sign your name. “I get to see a history of how my Father’s signature has changed over the years, “she quips. But it’s not the same everywhere. And when it comes to political primaries, practically nothing is. 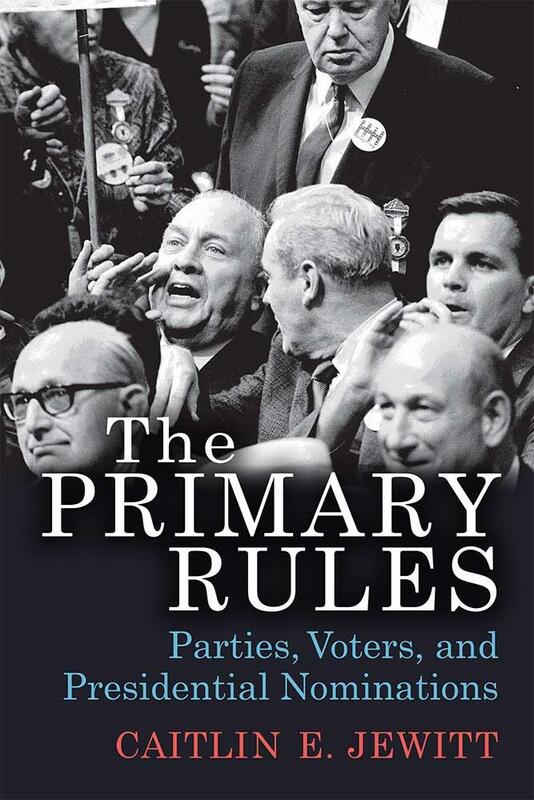 Her new book, The Primary Rules is published by University of Michigan Press. When state politicians draw voting districts to benefit their own parties we call it "Gerrymandering.” Recently, a federal court in Virginia ordered a new map drawn because the previous one unfairly packed black voters into districts. The new state district map is more favorable to Democrats. And Republicans have appealed it to the U.S. Supreme Court.